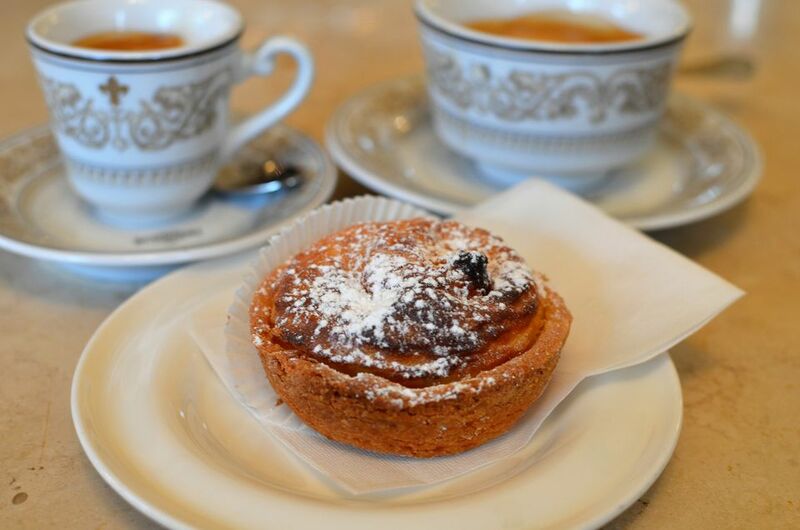 I am not generally a big fan of sweets for breakfast, which is why the typical Italian breakfast -- a cappuccino and a pastry -- is frankly not my favorite. During my years living in Florence, however, I grew quite fond of one particular breakfast treat that is sold in many coffee bars and pastry shops: the budino di riso ("rice pudding"): a little palm-sized tart with a golden, slightly crumbly short-pastry ("pasta frolla" in Italian, pâte sablée in French) crust containing a few bites of tender, fragrant rice pudding, scented with vanilla and either orange or lemon (or, as I like to do, a 50/50 mixture of both). Lightly dusted with powdered sugar and not overly sweet, they pair really well with espresso for breakfast or with a shot of Vin Santo (or any other dessert wine) for a light after-dinner treat, or a cup of Earl Grey for an afternoon teatime pick-me-up. They can be eaten at room temperature, and are easy to transport, so they make a great addition to any picnic or potluck. Use either small tart pans (about 2.5 to 3 inches in diameter) or a standard muffin tin to make 12 tarts. You can also use oval-shaped mini tart tins (they are often oval-shaped in Florentine pastry shops). They're usually made in smooth-sided tins, but you can use a fluted tin too -- it might just be a little more difficult to remove from the tin after baking. Note that for an even lighter treat, you can skip the crusts entirely and just bake the rice pudding directly in tartlet pans or muffin tin cups -- sometimes I prefer them this way, and I recently learned that these were originally made that way -- without any crust -- so arguably that's more traditional/authentic! In a food processor (if you don't have one, you can instead mix the dough in a large mixing bowl using a pastry cutter or your fingers), work the butter into the flour, together with the pinch of salt, until it resembles a coarse, sandy yellow cornmeal. Mix in the powdered sugar and transfer the mixture to a work surface. Form the mixture into a volcano shape (with a crater in the middle) and place the egg yolks and zest in the crater. Use a fork to beat the yolks and mix them into the flour, then use your hands to work the liquid and dry parts together just to form a dough. Be careful not to overwork it -- you just want it to stay together, otherwise your crusts will be tough and hard, rather than crumbly and tender. Form the dough into a round, wrap it in plastic wrap and refrigerate it for 30 minutes. Once the 30 minutes are up, preheat the oven to 350 degrees Fahrenheit (180 degrees Celsius). Remove the dough to a floured work surface and roll it out very thin (about 1/8" or 3 mm thick). Cut it into rounds slightly larger than your tart tins or muffin cups, using either a sharp paring knife or a round cutter shape. Fill each tin with dried beans (to keep the dough from puffing up while baking) and bake until golden brown, about 10 minutes. Remove and set aside to cool, then remove and discard the beans when cooled. While the dough chills, make the rice pudding and preheat the oven to 392 degrees F (200 degrees C). In a medium, heavy-bottomed pot over low heat, melt the butter. Add the rice and shot of Vin Santo (or other alcohol, if using), and stir with a wooden spoon for about 1 minute. Add the milk, sugar, vanilla seeds, and vanilla paste or extract and simmer gently, uncovered, over low heat until the rice is tender (but not completely mushy) and most (but not quite all) of the liquid is absorbed, about 15 to 20 minutes. Do not let the pudding get too dry, as it will dry out further in the oven and your tarts will be dry and tough, rather than moist and creamy. Stir in the beaten eggs and orange and lemon zest. Spoon the rice pudding into each pre-baked crust up to the edge and bake for about 10 minutes, or until the tops are firm and golden brown. Set the tartlet pans or muffin tin on a wire rack to cool, then remove the mini tarts to another wire rack to cool completely. Lightly dust with powdered sugar just before serving.